Having different types of calibration standards helps to cancel out the measurement error introduced by the use of connector adapters. If the DUT has a port type different from the one of the VNA, the use of "between series" connector adapters is inevitable. Using a calibration standard which mates with such adapter will move the calibration reference plane at (or close to) the DUT, "absorbing" the adapter in the calibration process. Speaking of calibration reference plane - the concept is very simple - the reference plane is the plane which divides the VNA-DUT system. Everything "behind" the plane belongs to the instrument and will be taken out of the measurements. Calibration is performed at the plane. Everything at or "in front" of the plane is treated as DUT and it will be measured. Often, calibration device can not be placed exactly at a specific plane inside the VNA's port connector or test fixture due to the standard's physical size and/or need for a connector. There is an electrical length associated with the cal standard (pin / mating plane to actual OSL plane) which will cause a small delay and phase angle error (such standards are called an "offset" type). To account for this phase shift, commercial calibration kits come with a floppy disk containing correction data for the offset among other parameters (for instance - the stray capacitance for an OPEN or the stray inductance for a SHORT). After calibration is performed and the corrections are applied to the calibration model, the reference plane is "moved back" and located at the port's mating plane. For this very reason, when a calibration standard is measured as DUT with already calibrated VNA, it doesn't look "perfect" - the VNA shows the standard's internal phase offset and strays. An excellent technical article about calibration standard definitions by William Highton (Chemandy Electronics) can be found here. "Using a calibration standard which mates with such adapter will move the calibration reference plane at (or close to) the DUT, "absorbing" the adapter in the calibration process. BUT the calibration kit used should be that of the DUT, not the VNA. So you should put the adapter on the cable, then calibrate after the adapter using a calibration kit for whatever connector your DUT has. This is exactly right! There is no need for "BUT" :-) as there is no argument here! The only reason I worded this as such is because many DIY VNA owners focus at making a calibration kit matching the VNA's native connector. What I was trying to say, is that one should have sets of Cal Standards, for each possible DUT connector type to be used. 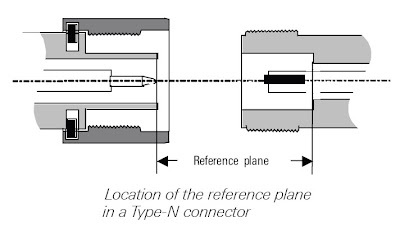 Then, any needed cable extensions and adapters will be taken out of the measurment process as the reference plane is moved by the location of the cal standard. Thanks for summrizing it a more clear way.